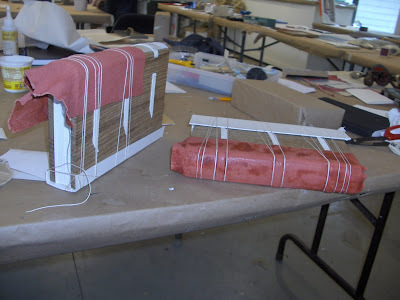 The third class I had at PBI was with Gary Frost and we covered a lot of material and worked on three different historic bookbinding models. We started with a simple struture called the Cartonnage and Free Leaf, which produced the smaller booklets shown above, which are not sewn. 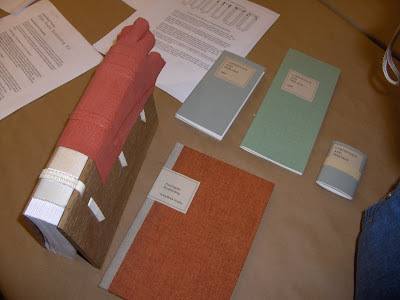 The second project was a sewn board structure, which is a wonderful style for edition binding - the one shown above bearing the label "Post-Digital Bookbinding". 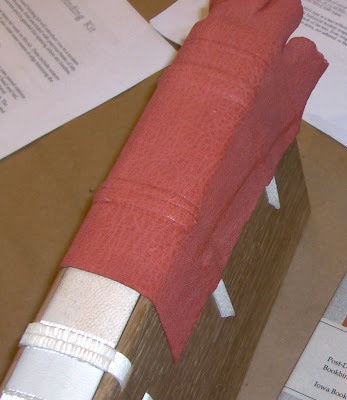 The third book was a wooden board binding, which is based on a 16th Century struture. The textblock is sewn onto split alum tawd thongs. It is a drawn on board structure, so the thongs are laced into the wooden board covers. The hardest part was drilling and chisling the slots in these hard oak boards. But it was worth the effort. 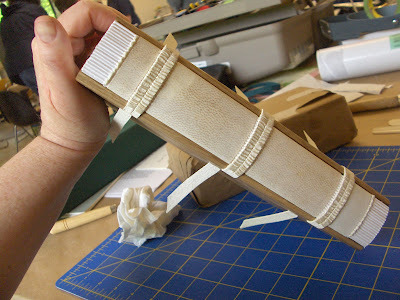 The spine is lined with vellum and it is tucked under the boards on the sides and pasted to the inside of the covers - creating a wonderfully satisfying opening action! This photo shows my book on the left, which I decided to cover only partially with the leather. 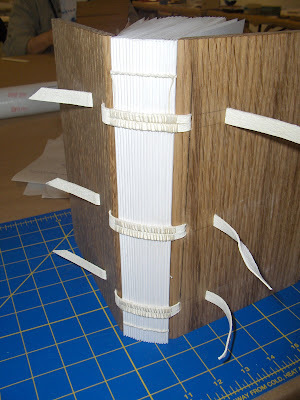 I opted to leave the top third of the spine exposed so that I can always see the work that I did on the spine. The other book, by another member of the class, has a full spine covering. The strings were left on there for a day, then removed. So the raised bands across the spine are nicely emphasized as a result. I still have to turn in the leather at the end - it isn't meant to flap loose like this but we ran out of time at PBI. I'm back home now, so hopefully I'll get this finished soon. I've been looking at yours and Bea Nettles' photos and feeling more envious each time. How were the accommodations? wonderful? gary's terrific and your books are sweet. i have absolute pbi lust! woops--the "wonderful?" above should be "wonderful!" These look great. I was wondering how you turn the leather in at the top of the spine? Did you leave a small portion unglued at the top end of the spine so that you could tuck in (and then glue) some of the excess leather?